PsychProcess09 is a program for computing the properties (enthalpy, specific volume, humidity ratio, relative humidity, specific heat, and dew point). It also calculates resulting properties for air mixing, cooling, and heat recovery. Total, sensible, and latent capacities computed for cooling and heat recovery processes. 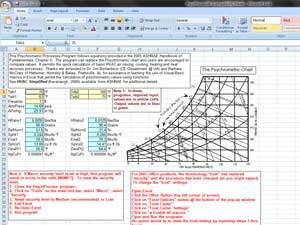 This Psychrometric Processes Program follows equations provided in the 2005 ASHRAE Handbook of Fundamentals, Chapter 6. The program can replace the Psychrometric chart and users are encouraged to compare values. It permits the quick calculation of basic HVAC air mixing, cooling, heating and heat recovery processes. Thanks are extended to Dr. Jim Richardson (CE Department @ UA) and Barbara McCrary of Hattemer, Hornsby & Bailey, Pratteville, AL for assistance in learning the use of Visual Basic macros in Excel that permit the calculation of psychrometric values using functions. See HVAC Simplified (Kavanaugh, 2006) available from ASHRAE for additional details.